Every custom-made library ladder is built specifically for you, to your exact dimensions. 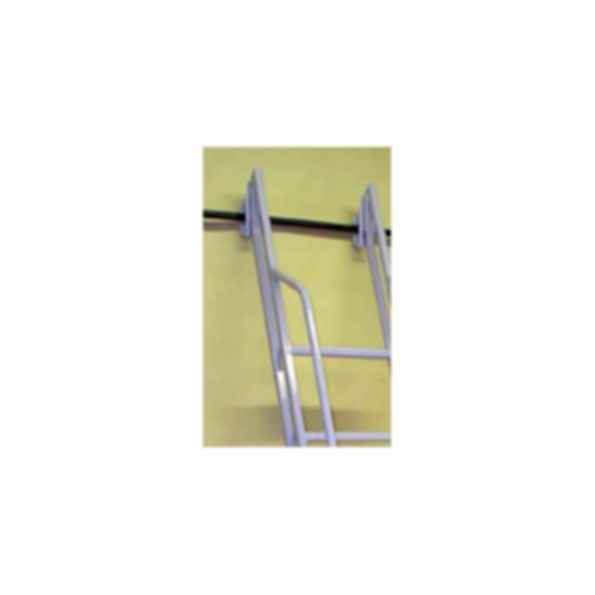 Our library ladders are designed with a safe and comfortable climbing angle of 17 degrees (be careful of library ladders which stand at a steeper angle - it really affects the comfort and safety of the person climbing the ladder). If less aisle space is available, a 12 degree climbing angle is available upon request. Our library ladders are also designed with 4" of travel in the upper slide assembly to allow for uneven flooring and to allow then to be pushed in towards the wall (a little) for storage. NOTE: library ladders are designed to roll out of the way when not in use. Our standard design does not stow flush up against wall. However, Optional vertical storage available upon request. And remember, library ladders are not just for libraries anymore! We see them in kitchens, pantries, wine cellars, stockrooms, and in home theaters for access to video/DVD collections.